Indian Oil Corporation Limited will soon activate IOCL Scholarship 2019 Application Form for those students who are pursuing B.A., M.A., B.com, M.com, B.sc, M.sc, B.tech, M.tech courses. This is the best opportunity for all those applicants who are suffering from the economic problem due to the weaker family. Applicants can fill application form of Iocl Scholarship 2019 through online mode visiting the Official web portal of the site. Every year, a huge number of students have appeared in this examination test. As per the rules, the foundation will be shortlisted by the students on the basis of their written test & marks performance. 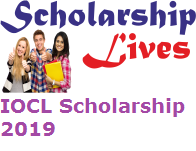 For getting more details about Iocl Scholarship 2019 keeps visiting on this web page. Applicant’s minimum age should be 15 years; maximum age should be 30 years. Indian Oil Corporation Limited is one of the best commercial enterprises. Students can apply for this scholarship by login to the main web portal of the site through online mode. Minimum marks to clear examination for PWD applicants are 50% and for SC/ST/OBC are 60%.